When shopping for a cajon drum, it's important to first identify what you want from the drum sonically which is determined on how and where you'll be playing. After reading the X8 Drums Cajon Buying Guide, you'll be able to narrow down the endless list of possibilities to a few finalists that meet your requirements for aesthetics, sound and price. The cajon drum comes from Peru where slaves from Africa used small container crates utilized for carrying fruits and vegetables to play rhythms and percussion grooves. They would take the empty crates, turn them up-side-down, sit on them and then play drum beats on the side panels. Since then, Peruvians have adopted the instrument and engineered the concept into professional quality instruments that have enormous dynamic range. Craftsmen around the world are taking the basic box concept and elevating its potential by adding snare effects, bells and multiple playing surfaces that provide percussionists numerous options for playing styles. It is not uncommon in modern music performances to see a cajon drummer playing bells and tambourines with their feet while playing the drums with their hands. This style fills out the full percussion range for an acoustic performance. Where will you be playing this drum most often? You want a well-constructed cajon with controlled, clean sound. Look to Kopf for high quality USA construction and consistent full response. 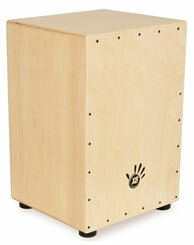 We especially like the Birch Series DeUno Cajon. You want a model that projects well and has good resonance. In the budget-range, the X8 Journey Series Cajon is a great choice. 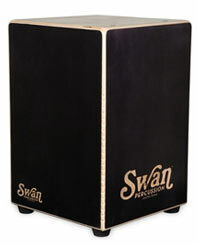 A higher-end model would be the Swan Percussion Corsoba Cajon which is larger than standard models with great response. Several cool options here: Check out the Toca Triple Conga Cajon that you can play standing up or Meinl's affordable Headliner Cajons. 2. How much snare response do you want from your drum? This style cajon is called the Peruvian Cajon and it produces a dry, tight response. We recommend the LP Americanan Peruvian Cajon. Many other cajon models offer options to silence the strings and snare to create a Peruvian effect however we have noticed that most models that offer this dual playing option often have a slight bleed from the snare or strings even after turning them "off". 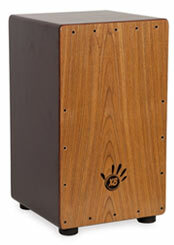 The biggest and baddest sizzle effect is going to come from the Swan Percussion Flamenco Cajon. Very dynamic instrument that will wash you in resonance. Couple of options for players that want to change their snare effect on the fly. 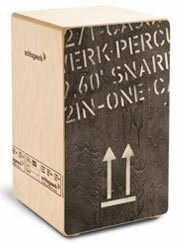 Check out the Meinl Bass Pedal Cajon. You can change the snare with your foot while you play although it lacks in precision control. Toca also offers a cajon where the snare can be adjusted by hand while playing... again precision control is lacking. 3. What the overall vibe you seek? There are many "bass cajon" models available. We love Pearl's Sonic Boom Cajon. Wow! Again, for studio cats or musicians that require pristine sound, there is a manufacturer for you! Check out Schlagwerk or Sela. Both brands produce incredible models for distinguished performers. Our favorites for this category include the X8 Journey Cajon, Kopf S-Series DeUno Cajon or the Swan Corsoba Standard Cajon. Playing for fun doesn't mean you have to sacrifice sound quality! 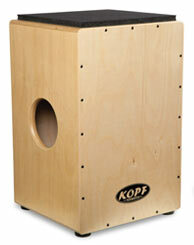 Check out the X8 Endeavor Model, Kopf Student Series, Meinl Headliners or Build Your Own Cajon. Taking lessons. I want to be good at this! Making a commitment? Look hard at Kopf, Schlagwerk 2inOne or the LP Mario Cortes Cajon. I'm a pro and and am happy to pay up for perfection. We're finding that pro players are very happy with Kopf Birch Series, Swan Percussion Corsoba Deluxe, Schlagwerk 2inOne Macassar or the CaSela Satin Nut Cajon.